Told from the perspective of Christopher, a 15-year old autistic boy, this play overwhelms the audience with heightened sensory overload. 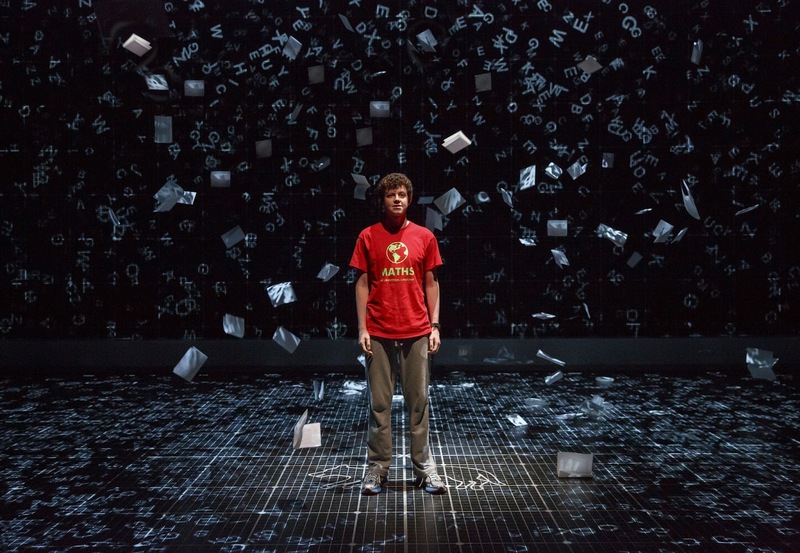 The touring company’s rendition of “Curious Incident” at the Bushnell is largely effective, even though the play most certainly works even more effectively in a slightly smaller theatre where the sound system is more evenly balanced. Still, the grid-like set, complete with video projection and LED lighting contributes to an evening that draws the audience into the story and makes you understand what life is like for an autistic individual who struggles with complex situations. Christopher becomes obsessed with trying to find out who killed his neighbor’s dog. As he begins his detective work, he learns a family truth that has been withheld from him, and he goes about seeking answers—a difficult path for a young man who doesn’t comprehend irony or metaphor. The role of Christopher is exceedingly physically and vocally demanding and for this company, performances are shared by Adam Langdon and Benjamin Wheelwright. On the evening I saw the show, Langdon embodied the role with dexterity and energy, though his voice is a bit too mature for a teen. I’ve seen this performer before, and Langdon is undoubtedly an actor to watch as his career develops. He’s aided in this production by a multi-racial ensemble of seasoned veterans. Gene Gillette as Christopher’s father is particularly effective as a parent who tries to do the right things for his special-needs son, only to find that good intentions sometimes backfire. The Broadway production of the play received five Tony Awards in 2015 for Best Actor, Best Play, Best Director, Scenic Design, and Lighting Design. The success of the show is balanced with all of the components, though the actor playing Christopher has the greatest burden in terms of maintaining stamina and gaining sympathy from the audience. Based on the first-person book written Mark Haddon in 2003, the story gives the audience a sense of what it is like to live with autism, and we cheer when we find this truly original hero optimistic about his future and his ability to live in the complicated “typical” world. Lauren Grossman: co-producer, editor, host, etc., etc. As In the Spotlight continues, thanks to all of you for helping to create Bravo (in all of its forms). In March, 1991 Bravo Newspaper was founded, serving the local arts community as a free monthly publication. Twenty-five years later, Bravo has become In the Spotlight, a website primarily promoting the arts in Greater Springfield. Many from the former Bravo staff and current In the Spotlight staff will get together on December 14, 2016 at 235 State Street, Springfield at 7:30pm to celebrate this anniversary. Equally important is formal acknowledgement to the Springfield Cultural Council for its initial grant which launched Bravo. That successful application for $6450 provided financial support, along with at least 50 grants from throughout Pioneer Valley, for the next 25 years. Shera Cohen, of Springfield, and Lauren Grossman, of Longmeadow (now Arizona) ended their work for the Chicopee Centennial in December, 1990. “What to do now?” Both women had theatre backgrounds. “Let’s start a theatre newspaper,” Grossman said. Cohen followed with, “I don’t even know how to use a computer.” They both learned the mechanics; the subject matter grew from theatre to all the performing and visual arts; and office space moved from Grossman’s pool table, to Cohen’s living room floor, to a tiny office with stained glass windows, to one larger office on State Street, finally to three different spaces on Main Street, with each location larger than the one before. The Springfield Cultural Council grant paid for production and printing of 1,000 papers monthly with distribution only in Springfield. Cohen and Grossman were the entire “staff” of Bravo which included writing articles, selling ads, design and paste up (computers didn’t perform as they do now), and delivery. Year #2 of Bravo increased distribution city-wide and to five cities/towns – each due to receiving more grants from as many cities. A few writers and a salesperson were added to the team. At its 12-year mark, Bravo delivered boasted 50,000 readers in 48 cities with a staff of approximately 50 at its high point. Looking toward the 21st century here, Bravo printed its last publication in 2003, at the same time morphing Bravo to In the Spotlight electronic media. Many writers from the newspaper continued with Spotlight, even those who joined in 1992. In the Spotlight continues as a local source of reviews, previews, interviews, and “on the road” features on community and professional performing arts in the region. Like the cherished holiday movies and TV specials from which its characters spring, “Christmas on the Rocks” is fast becoming its own cherished seasonal tradition. Director Rob Ruggiero has conceived a holiday confection using all the right magical ingredients. He starts with original short stories written by the likes of John Cariani ("Almost Maine"), Jeffrey Hatcher ("Tuesdays With Morrie"), and Jonathan Tolins ("Buyer & Cellar"). Then he stirs in adult versions of iconic pop-culture figures, such as Tiny Tim, Charlie Brown, and Clara from the Nutcracker. Mixed with a solid serving of talent from three performers playing multiple roles and a dash of creative costuming, “Rocks” fourth Theatreworks appearance makes for an entertaining yuletide feast. Much credit must be given to Jenn Harris and Matthew Wilkas for bringing absolutely unique life to their various roles. Multiple refrains of “I had no idea it was the same person” were heard upon leaving the theatre. Each has the opportunity to play broadly humorous and touchingly melancholy with equal aplomb. Pulling double duty, Harris and Wilkas also wrote a new piece for this year’s production; a riff on social media frenzy from a “Frosty the Snowman” perspective that was a crowd pleaser. 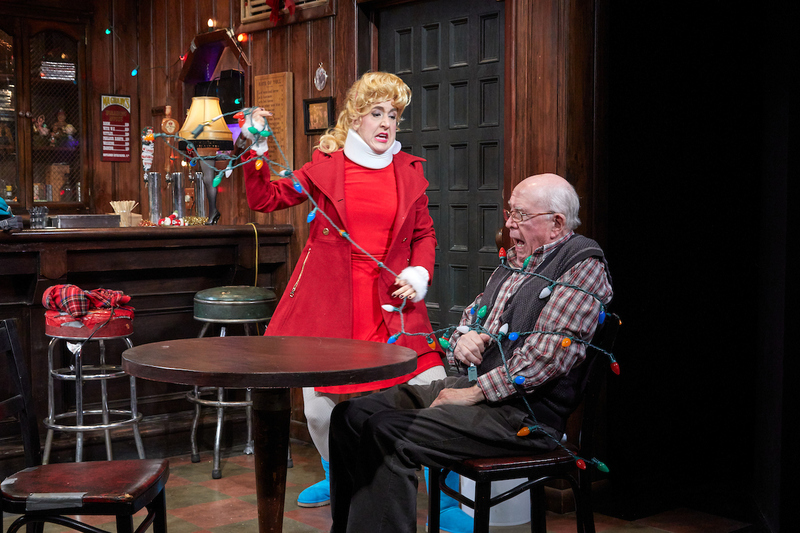 What works well is that the characters don’t necessarily take the most obvious path, with the playwrights often using more subtle points as the jumping off point, as is the case of Ralphie from “A Christmas Story” or Susan from “Miracle on 34th Street”. Holding it all together is Ronn Carroll as the barkeep of a tiny bar (lovingly executed by set designer Michael Schweikardt). Having “seen it all,” he quickly shows the audience how to suspend disbelief and go along with the (sleigh) ride. His experience at playing this part for all 4 years of the show’s run is evident, especially in his ability to not break character in the face of some outlandish antics (and clever puns). For those not intimately familiar with the source material, be sure to take a stroll through the lobby where characters’ more “youthful” photos hang. Even so, now that they’re “all grown up” they display universal attributes that anyone can relate to as they try to find the spirit of the season despite disillusionment and disappointment. For those who long for something different (funnier) from the customary “A Christmas Carol” or “The Nutcracker,” your (Christmas) wish has come true once again at Theaterworks. Springfield Symphony Orchestra: It's A Wonderful Life! It was a wonderful concert... the Springfield Symphony Orchestra under direction of guest conductor Nick Palmer brought out a sense of wonder in the season with the Springfield Symphony Chorus and the Children's Chorus of Springfield. "We Need A Little Christmas" set the tone for great musical beginnings and warm moods of connection in good cheer. Cantor Morton Levson sang "There Are Stars" in an amazing voice that resonated a heartfelt joy. SSO accompanied him on "A Heart of Wisdom" with loving sentiments and a powerful message of cherished beauty of life. This is what makes it a wonderful life... teach us to number our days and love the moment. Gifted chorus director Nikki Stoia led the Symphony Chorus in "Oh, Christmas Tree" which flooded the audience with fond memories of joy. Audience participation ensued with a clapping beat of joy urged on by Stoia. Santa Claus appeared to announce WMASS newsman Dave Madsen to the stage for a reading of "Twas the Night Before Christmas" with the strings moving the story wonderfully while the percussion accented with fun sound effects at appropriate times. The Children's Chorus sang selections from "Frozen" in endearing harmonic voices. The Orchestra's "Carol of the Bells" worked a magical spell of delight. Symphony Hall was decorated with a large wreath above the stage and a garland of smaller wreaths strung around the balcony posts. This is certainly a large venue, yet at the same time it seemed cozy. "It's A Wonderful Life" completed the hometown atmosphere. "Minor Alterations" featured woodwinds and strings mixing classics with Klezmer to a rousing finish. "Stille Nacht" with the simple beauty of piano to start combined added instruments and voices for glorious effect. "Sleigh Ride" made for fun musical moments with percussive horse hooves, whip, and sleigh bell sounds. Humorous seasonal dialogue between Santa and the conductors led to a warm and fuzzy audience sing-long. “The Hallelujah Chorus” from The Messiah brought the house down for a wonderful finale!